Generate unbuilt overviews or cache. Return an item in the mosaic dataset back to its original configuration (when added). To understand synchronizing mosaic datasets, it's important for you to understand how the data is organized within them. For example, you can have data referenced directly from its source location or using another mosaic dataset. This most common configuration is a mosaic dataset where the imagery and raster data is referenced directly. Because of the direct relationship to the source data, it is described as the source mosaic dataset. This configuration often serves as the base of other mosaic datasets that may be generated. A source mosaic dataset has the image and raster data added directly. There are other configurations where a mosaic dataset is the source input to another mosaic dataset. For example, a derived mosaic dataset is created just like the original (source) mosaic dataset, but the data added comes from at least one other mosaic dataset. A mosaic dataset is added to a derived mosaic dataset, and a mosaic dataset and source data are added to a derived mosaic dataset. When creating a derived mosaic dataset, the data can be added using the Table raster type, where every row in the source mosaic dataset is added to the derived mosaic dataset. This allows users to query and examine all the original items in the mosaic dataset, as if they were added directly. Or the source mosaic dataset can be added using the Raster Dataset raster type, where an entire source mosaic dataset will be added as a single item to the derived mosaic dataset. With this, users no longer have access to each item individually. A derived mosaic dataset can contain many mosaic datasets or even a combination of mosaic datasets and source images. Synchronization is very useful for keeping the derived mosaic datasets updated with any changes in the source mosaic datasets. A referenced mosaic dataset is a unique type of mosaic dataset. It behaves like a regular mosaic dataset; however, you cannot add additional rasters to the mosaic dataset, you cannot build overviews, and you cannot calculate the pixel size ranges. Reference mosaic datasets are created using the Create Referenced Mosaic Dataset tool and by defining another mosaic dataset as the source. Typically, this source could be a source mosaic dataset or a derived mosaic dataset. Reference mosaic datasets are only created from other mosaic datasets (or a raster catalog). Reference mosaic datasets maintain a close (live) relationship with the source; therefore, they do not need to be synchronized manually. However, if the source is moved, the paths may need to be updated. 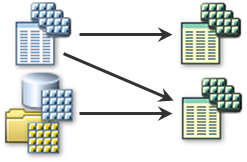 Synchronization is a one-way operation, where changes in the source data can be synchronized to the mosaic dataset's attribute table, but changes in the attribute table will not affect the source data. For example, if the source is a raster dataset that has had its georeferencing modified, synchronization will be make this update in the mosaic dataset. Or if the source is a mosaic dataset, and you added a function to an item in the attribute table or added an item to the source mosaic dataset, then the derived mosaic datasets will be updated accordingly. You should synchronize the source mosaic dataset before synchronizing the derived mosaic dataset, since the derived mosaic dataset will only be updated with the information in the source mosaic dataset. When you update items, they will be rebuilt, which includes resetting attribute table fields and function chains to reflect the source data and the setup defined by the raster type. Therefore, if you have made changes to these things, you will need to deselect the fields in the attribute table that you don't want updated. If you added imagery using an altered QuickBird raster type, then the same settings will be applied when adding new QuickBird imagery. However, if the new imagery is Landsat, then it will not be added since this raster type was not originally used to add imagery to the mosaic dataset. Additionally, when you added the imagery, whatever options were set on the Add Raster To Mosaic Dataset tool will be applied, such as Build Raster Pyramids, Calculate Statistics, and an Input Data Filter. To update a mosaic dataset with new imagery, you will run the Synchronize Mosaic Dataset tool on the mosaic dataset with only the following options checked: Update With New Items and Update Overviews (this option will update the cell size ranges and boundary as part of its operation). If you have a derived mosaic dataset created from a source mosaic dataset you will run the same tool with the following option checked: Update with New Items. If your derived mosaic dataset only contains the source mosaic dataset, then you don't need to add any other options, but if it has its own overviews, and may contain multiple source mosaic datasets, then also check Update Overviews. Using the Synchronize Mosaic Dataset tool to add new imagery (in exiting folder locations) is more efficient to run than to run the Add Rasters To Mosaic Dataset tool with the EXCLUDE_DUPLICATES option selected. There are several scenarios where imagery may be added to a mosaic dataset, and refinements will be made at a later stage. This is common when the imagery needs to be made available quickly and you don't want to spend time to refine options like projection information, seamlines, or footprints. For example, when adding aerial imagery, the camera frame specifications may be refined over time to improve the accuracy of the imagery. In this case you will use the Synchronize Mosaic Dataset tool with the following options checked: Update Existing Items and Update Raster From Data Source. There may be times when you have made edits to the source mosaic dataset, such as editing footprints and seamlines or updating or adding fields to the attribute table, that you want reflected in the derived mosaic dataset. In this case you will use the Synchronize Mosaic Dataset tool with the following options checked: Update Existing Items, Update Raster From Data Source, and Update Fields (with the appropriate fields selected). If you have modified some of the source files, such as the aux.xml or the projection file, or updated or created new files, such as updating the source images (such as the .tif), the metadata file, or pyramids, then you will want to use the Synchronize Mosaic Dataset tool with the following options checked: Update Existing Items and Synchronize Stale Items Only. The Synchronize Mosaic Dataset tool will work on all the items in the mosaic dataset unless there is a layer selection or SQL query definition. Unprocessed overviews or overviews that need updating because new source data was added or data was removed. Items where the source data has been updated since it was last added (or last built). This is indicated by a time stamp. There are cases where you may have cache built for one or more items in the mosaic dataset. For example, when you have complex processing occurring on one item, such as orthorectification, pan-sharpening, and color correction, you may want to create a cache (which preprocesses the item) to improve the speed of the mosaic dataset (or image service). In this case, the cache is added using the Cached Raster function. Additionally, item cache is generated for each item when you add LAS files, LAS dataset, or terrain datasets to a mosaic dataset. To generate or update the cache for these items use the Synchronize Mosaic Dataset tool with the following options checked: Update Existing Items and Build Item Cache. Before you assume that the items are broken, you should first check to see if there are any broken paths. Broken items include situations where there may be a missing band in an image, or the DEM is missing for an orthorectified image, or the sensor metadata file used to generate the image is missing. When these things are missing, the item in the mosaic dataset cannot be rebuilt and may not display correctly; therefore, you can choose to remove them. When you remove them, only the item in the mosaic dataset is removed, the data is not deleted from disk. To do this you will use the Synchronize Mosaic Dataset tool with the following option checked: Remove Items With Broken Data Source. You may want to also check the options to update the cell size ranges, boundary, and overviews if you think they'll be affected.